With its numerous nutrients and wonderful flavor, coconut oil makes the perfect addition to almost any recipe. Whether you’re after its health benefits or finding a new secret ingredient for your recipes, incorporate the popular oil into your daily routine by pairing it with everything from your morning coffee to your family’s favorite stir fry. Adding coconut oil to hot drinks like tea and coffee is an easy way to get your daily dose of nutrients. It’s sweet enough to substitute for sugar in tea, and makes the perfect combination for soothing a sore throat. With its sweet flavor and creamy texture, coconut oil also makes a great substitution for creamer in coffee. Bonus: it moisturizes your lips while you drink it! Use coconut oil in recipes as a replacement for butter. Although butter is relatively lower in both calories and fat content, coconut oil has many more nutrients and minerals. Plus, coconut oil gives baked goods a sweeter flavor and a lighter texture. Swap out boring vegetable oil for coconut oil when sautéing and frying. 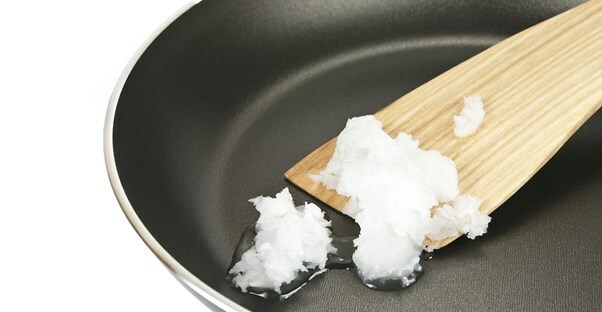 Coconut oil has a much higher smoke point than any other cooking oil and will give your food a unique flavor that will have everyone asking for your secret recipe. Adding coconut oil is the smartest option for those who choose smoothies as a replacement for a meal because the medium chain triglycerides (MCTs) in coconut oil help you to feel fuller longer. MCTs also give you a boost of energy, which makes coconut oil a great addition to any protein smoothie. Plus, it will give your smoothie the perfect tropical flavor. Skip the processed, store-bought movie theater popcorn and make your own instead. Using coconut oil will give stove-top popcorn a sweeter taste and will keep it fresher longer if you end up with leftovers. Make it even sweeter by drizzling the coconut oil on top of the popcorn to top it all off.